"Inflation is when you pay fifteen dollars for the ten-dollar haircut you used to get for five dollars when you had hair." Does a dollar go as far as it used to? It might seem that you're paying higher and higher prices for the goods you buy. However, the data show that inflation has been virtually nonexistent for much of 2015. And the inflation rate has been lower than the Federal Reserve's 2 percent inflation goal for more than 3 years.1 Nevertheless, when many people hear reports of lower-than-average inflation rates, they may not feel it reflects their experience as consumers. Where is the disconnect between the experience of individuals and what the data show? Generally speaking, inflation means the average level of prices is rising. More specifically, inflation is a general, sustained upward movement of prices for goods and services in an economy. Prices have tended to rise over time, which means that the inflation rate (the percentage increase in the average price level of goods over a period of time) has been positive. And, as prices rise, the purchasing power of each dollar diminishes. A 2 percent inflation rate means that (on average) a dollar buys 2 percent fewer goods and services than it did last year. You might be surprised to discover that even after accounting for the effect of rising prices (inflation), average incomes have risen over time.2 So, while it's true that prices generally rise over time, so do people's incomes, which usually allows them to purchase more goods and services. Inflation can be measured in a variety of ways, depending on which "basket" of prices is measured and how those prices are weighted. The most widely reported measure of inflation is the consumer price index (CPI). The CPI measures the average change over time in the prices paid by urban consumers for a market basket of consumer goods and services. The current CPI market basket was constructed based on input from spending diaries kept by 28,000 consumers and another 60,000 quarterly interviews conducted in 2011 and 2012. All this information was used to determine what people were actually buying.5 Data collectors visit places of business to collect price information monthly to record the prices of about 80,000 items that make up the market basket.6 The prices of goods and services in the market basket are then "indexed" to make it easier to compare changes in the price of the market basket over time. To do this, the Bureau of Labor Statistics sets the price of the market basket during a particular time period equal to "100." Changes in the index value are used to measure inflation and calculate the inflation rate. For example, if the index rises from 100 to 103 in a year, the inflation rate for that 1-year period is 3 percent. Also, notice the use of the word "urban"; the CPI is meant to reflect the purchases of the typical urban consumer, which represents about 87 percent of the U.S. population.7,8 People who live in rural nonmetropolitan areas, farm families, people in the armed forces, and those in institutions are not included in the calculation; therefore, the CPI does not attempt to reflect price changes for these consumers. Statistics are often reported as an average, but that average might not reflect the experience of any given individual in the sample. For example, the average age of a person living in the United States is 37.6 years9 and the average income is $46,163 (personal income per capita).10 Are you 37.6 years old with an income of $46,163? Chances are you don't fit this average exactly. Similarly, your personal inflation rate will likely differ from the CPI inflation rate. The CPI market basket is an average calculated to reflect the spending of the average urban household, not any specific individual household. Because each individual buys a different basket of goods and services, potentially every person has his or her own inflation rate. Your personal inflation rate depends on how you spend your money. For example, let's assume you hit the "average person" mark fairly closely: You are about 37.6 years old, born on January 1, 1978. During your lifetime, the prices of all items in the CPI market basket have risen approximately 278 percent (an average annual rate of 3.7 percent). However, when separated into categories, medical care has risen 653 percent (an average annual rate of 5.6 percent), while apparel has risen only 57 percent (an average annual rate of 1.3 percent) since your birth. You can likely see how your individual market basket influences your personal inflation rate (see the figure). If you have spent a larger portion of your income on medical care, for which the average price has risen faster than most prices, your personal inflation rate has been higher than the CPI inflation rate. On the other hand, if your twin sister has spent a larger portion of her income on clothes, for which the average price has risen more slowly than most prices, her personal inflation rate has been lower than the CPI inflation rate. NOTE: As stated in the essay, the average age of individuals in the United States is 37.6 years. Assume here that the average person was born on January 1, 1978. Using FRED® to set the index at 100 on that date, prices of all items in the CPI market basket have risen approximately 278 percent (blue line). However, when separated into categories, medical care has risen 653 percent (red line), while apparel has risen only 57 percent over that period (green line). SOURCE: FRED®, Federal Reserve Economic Data, Federal Reserve Bank of St. Louis. Consumer Price Index for All Urban Consumers: All Items, Medical Care, Apparel; https://research.stlouisfed.org/fred2/graph/?g=1AxN. The Everyday Price Index (EPI), published by the American Institute of Economic Research (AIER), is designed to reflect price changes for the goods and services people buy frequently—at least once per month. The index uses the CPI but simply pulls the goods and services purchased on a day-to-day basis out of the CPI basket and puts them into the EPI basket. In other words, it creates a smaller market basket that includes only these everyday goods and services. Note that the EPI is not meant to reflect total consumer spending; rather, it is meant to reflect the "price changes felt by Americans on a day-to-day basis. "11 The AIER tracks and reports monthly on the inflation rate of this market basket. The EPI focuses on purchases that consumers cannot easily postpone or forgo (such as food, fuel, and prescription drugs). Consumers must absorb the fluctuations in prices as they happen. The largest categories in the EPI basket (comprising nearly half) are food at home (21.5 percent), food away from home (15.1 percent), and household fuels and utilities (13.4 percent).12 By contrast, the BLS gives those same categories much lower weights in the CPI market basket: food at home (8.4 percent), food away from home (5.8 percent), and household fuels and utilities (5.2 percent).13 Goods such as cars, appliances, and furniture are not included in the EPI simply because they are not everyday goods. They are purchased infrequently, or consumers can sometimes delay the purchase of these goods.14 The EPI also excludes goods with prices fixed by contract, such as mortgage and rent payments, because consumers are protected from price increases during the contract period. This smaller market basket is more volatile than the much larger CPI market basket. Over the past 20 years, the EPI indicates that everyday prices have risen by 76 percent (an average annual rate of 3.2 percent), while the CPI indicates that prices have risen by 56 percent (an average annual rate of 2.3 percent). The EPI might be helpful in explaining the difference between the actual (lower-than-average) inflation rate and the perception by many people that prices are rising quickly. Differences in the visibility of certain prices might also impact your perception of inflation. For more information, see the boxed insert, "Perception and 'Visible' Prices." The CPI is designed to reflect the purchases of the typical urban consumer, and not all people are typical or urban. More importantly, the CPI is meant to reflect the experience of the average household, but differences in individual consumer choices nearly guarantee that the inflation rate experienced by any individual varies from the average inflation rate. In addition, the prices of some goods that are more visible might influence people's perception of inflation because the prices are both noticeable and volatile. In short, it is good to remember that when it comes to national statistics such as the CPI, actual (individual) results may vary. 1 "Inflation Misses Fed's 2% Target for 38th Straight Month." Real Time Economics (blog), Wall Street Journal, August 3, 2015; http://blogs.wsj.com/economics/2015/08/03/inflation-misses-feds-2-target-for-38th-straight-month/. 2 Real disposable income per capita in the United States has increased by 221 percent since April 1960 (see https://research.stlouisfed.org/fred2/graph/?g=1sPx). 3 Economists prefer a small "inflation buffer" to reduce the risk of deflation. 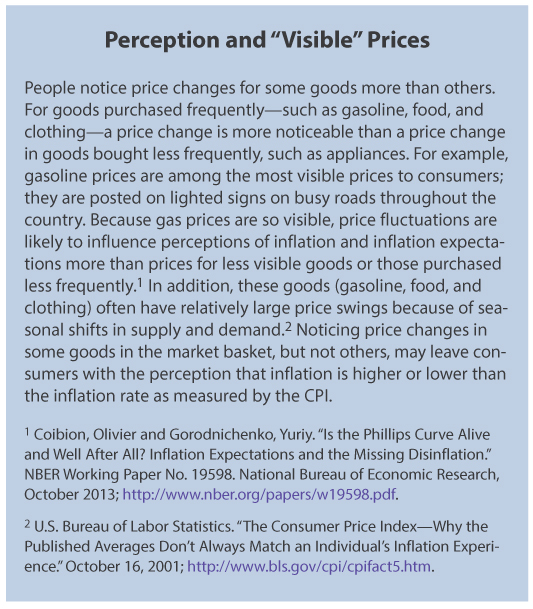 For a more detailed discussion of inflation in the context of price stability, see Wolla, Scott A. "Money and Inflation: A Functional Relationship." Federal Reserve Bank of St. Louis Page One Economics Newsletter, March 2013; https://research.stlouisfed.org/publications/page1-econ/2013/03/01/money-and-inflation-a-functional-relationship/. 4 Board of Governors of the Federal Reserve System. "Press Release." January 25, 2015; http://www.federalreserve.gov/newsevents/press/monetary/20120125c.htm. Note: While the Federal Reserve considers many measures of inflation in its assessment of the economy, its inflation objective is stated in terms of the personal consumption expenditures price index (PCEPI). 5 U.S. Bureau of Labor Statistics. "Consumer Price Index. FAQs: Question 6." Updated September 17, 2014; http://stats.bls.gov/cpi/cpifaq.htm#Question_6. 6 U.S. Bureau of Labor Statistics. "Consumer Price Index. FAQs: Question 8." Updated September 17, 2014; http://stats.bls.gov/cpi/cpifaq.htm#Question_8. 7 U.S. Bureau of Labor Statistics. "Consumer Price Index. FAQs: Question 3." Updated September 17, 2014; http://stats.bls.gov/cpi/cpifaq.htm#Question_3. 8 The Federal Reserve Bank of Atlanta offers a CPI tool that may more accurately reflect an individual household's market basket. Its myCPI tool allows you to track the prices of a market basket more like yours and compare your CPI with the national average. See https://www.frbatlanta.org/research/inflationproject/mycpi.aspx. 9 Central Intelligence Agency. The World Factbook. Updated July 15, 2015; https://www.cia.gov/library/publications/the-world-factbook/geos/us.html. 10 FRED®, Federal Reserve Economic Data, Federal Reserve Bank of St. Louis. Personal Income Per Capita; https://research.stlouisfed.org/fred2/series/A792RC0A052NBEA. 11 Cangero, Theodore; Delorme, Luke F. and Vlasenko, Polina. "Improving the Everyday Price Index." May 16, 2014; https://www.aier.org/research/improving-everyday-price-index. 12 Cangero, Theodore. "Poultry and Eggs Lead Food Prices Higher." July 17, 2015; https://www.aier.org/research/poultry-and-eggs-lead-food-prices-higher. 13 U.S. Bureau of Labor Statistics. "Table 1 (2011-2012 Weights). Relative Importance of Components in the Consumer Price Indexes: U.S. City Average, December 2014." http://stats.bls.gov/cpi/cpiri_2014.pdf. 14 Cangero, Theodore and Delorme, Luke F. "EPI Methodology." May 15, 2014; https://www.aier.org/research/epi-methodology. Consumer price index (CPI): A measure of the average change over time in the prices paid by urban consumers for a market basket of consumer goods and services. Inflation rate: The percentage increase in the average price level of goods and services over a period of time. Market basket: A selected group of consumer goods and services whose prices are tracked for calculating a consumer price index and measuring the cost of living.